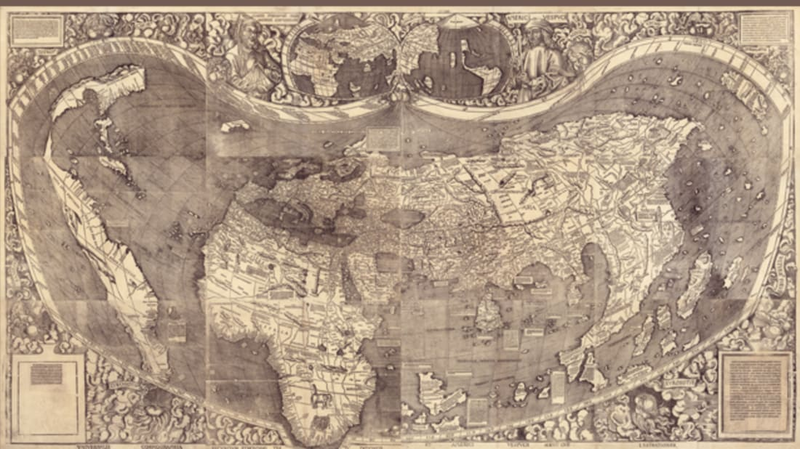 The Library of Congress calls Martin Waldseemüller's 1507 map of the world the "crown jewel" of their map collection. Now, the institution—which houses the only surviving copy of the first printing of the map—has partnered with the Galileo Museum to create a comprehensive interactive exhibit. A Land Beyond the Stars presents the map as well as the wide-ranging historical context for its creation. The interactive is a product of an ambitious program to update the image of the world to reflect information from recent voyages of discovery to the New World, including those of Amerigo Vespucci. It was Waldseemüller who named the new lands "America" on his map. It's easy for history or cartography enthusiasts to get lost in the site. There are succinct and illustrated videos on everything from Ptolemy's geography to Marco Polo to the Turkish blockade of the Mediterranean, all which had an important effect on mapmaking of the era. Here are a few of my favorite parts. How did navigators use maps to plan their routes? With sea charts, based on the directions of the winds. This video shows how they were created. The map is covered with cartouches, small panels that give information about the people, animals, or resources in a place. For example, on the east coast of China there is "liquorice, geraniums, and stones in large quantities." On the north coast of Russia the inhabitants "have no king, they live like animals, they are tall, strong, and beautiful men. They possess no wine or grain but have an abundance of meat." And off the coast of Madagascar "one can see the orca, a sea monster as wondrous as the sun, when it reflects light, whose appearance can hardly be described, except that it has a soft skin and very abundant flesh." The exhibit also covers the previous attempts to map the world, explaining how they came to be and how they envisioned the world. While fascinating on their own, these older maps and globes give weight to the achievement that Waldseemüller's map represents. Discover your own favorite sections of the exhibit at A Land Beyond the Stars.